The Gondola Blog: Fast! And...Purple! of a purple racing gondola plowing by in the Regata di San Michele. "need to get a purple gondola like that one!" The "racing gondola" is an interesting vessel; she's got the same dimensions as a passenger gondola, but she weighs a lot less. 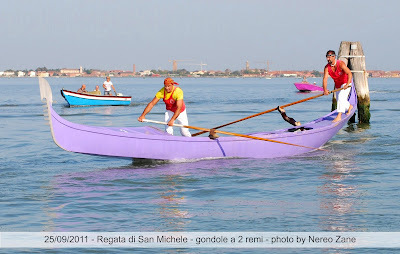 On my first visit to Venice, I spent a week on the lagoon rowing a similar boat with maestro Arturo of the GSVVM. It took me a while to figure out why the boat I was rowing didn't behave the same way my passenger gondola did back in Newport. These boats weigh about half as much as a standard passenger gondola.